Other: In the summertime, you are able to drive up to a parking lot that’s less than 0.1 miles away from the waterfall. In the winter, the road is closed so you have to hike or snowshoe in. For MLK weekend, Michael and I headed down to Bend, OR, with the OHSU Dental School. 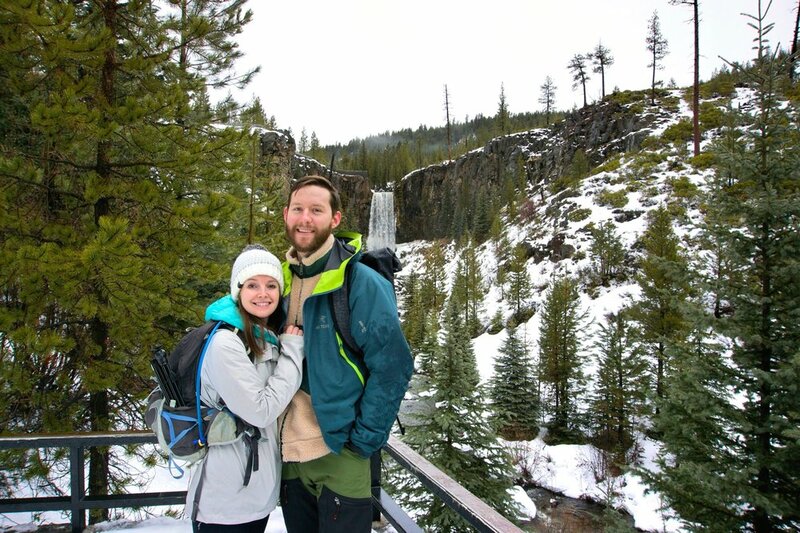 We stayed at the stunning Sunriver Resort and opted to go for a snowshoe hike instead of skiing on Saturday. We headed out to the trailhead first thing in the morning to beat the crowds. When we arrived (around 9:00am) we were the second car in the parking lot, by the time we left around noon, there were cars lined up the road! So be sure to get there early if you’d rather hike in peace and quiet. You’ll definitely want to bring snowshoes if you have them, but if you don’t have them, there are certain parts of the trail that are packed down enough you could probably hike on top. Overall this hike was relaxing and easy. There is barely any elevation gain, with the little bit you do experience on the hike in. The hiking is straightforward, just follow the road to the waterfall. We hope everyone had a great MLK weekend and had a chance to get outside! !